Discussing the recent development of High Temperature Superconductors for fusion magnet applications: the participants to the HTS workshop at KIT last week. 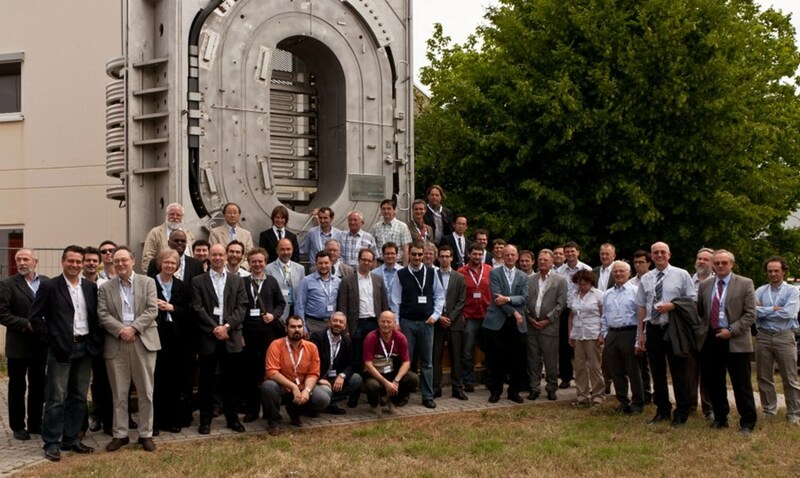 On 26-27 May, over 60 scientists met at the Karlsruhe Institute of Technology (KIT) in Germany to discuss the use of high temperature superconductors (HTS) in future fusion magnets, for example those that will be needed for DEMO. In a series of presentations, the status and prospects of HTS materials for future fusion magnets was reviewed. Gianfranco Federici, head of the recently formed EFDA Department on Power Plant Physics & Technology (PPP&T) gave an overview of technical challenges on the path to DEMO and the strategy of EFDA on power plant physics and technology, followed by a talk that targeted the challenge for superconducting magnets in fusion. In dedicated sessions the basics of HTS, the status of highly optimized HTS material fabricated by industry, and details of HTS materials at 50 K in the field range up to 20 Tesla were presented. Ideas and first demonstrators of scalable fusion conductor designs and possibilities for joint formation were shown and issues like mechanical and electrical stability, AC loss optimization and influence of neutron radiation on HTS were discussed. The workshop allowed for valuable scientific exchange on the use of HTS material for future fusion magnets. The advantages of this material are numerous: HTS reaches the highest magnetic fields with a sound temperature margin and stability; it allows for savings in the investment and operation cost for cryogenics; and simplifies machine design by omitting cryogenic shielding. The presentations of the workshop can be found under http://www.itep.kit.edu/hts4fusion2011.